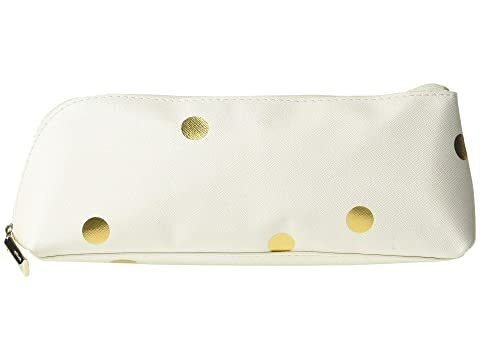 Be focused and chic with the Kate Spade New York® Dot Pencil Case. Classic pencil case in a durable vegan leather with an eye-catching dot design throughout. Small pouch is perfectly sized to carry pencils, pens, highlighters, markers, etc. with ease. Exposed zipper with a leather pull. Accessories included: ruler, 2 pencils, eraser, and pencil sharpener. We can't currently find any similar items for the Dot Pencil Case by Kate Spade New York. Sorry!